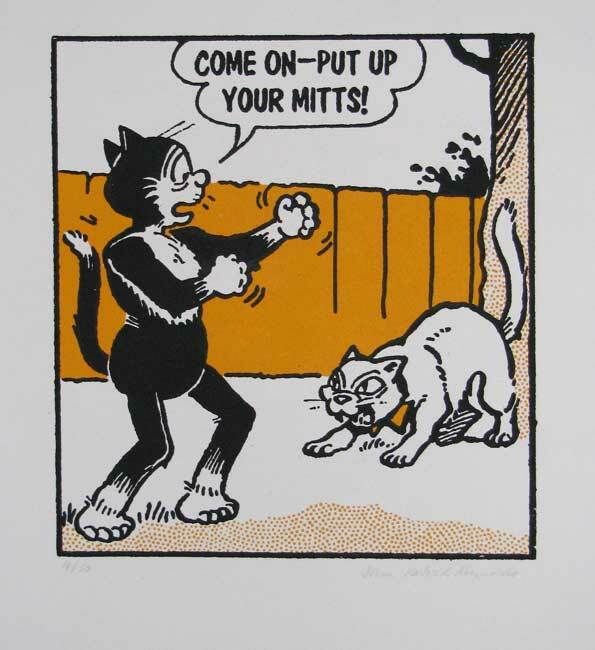 A screen Print reworked from the early C20th cartoon strip based upon the character of Felix the Cat; printed on hand made Somerset paper and issued in a limited edition. Felix the Cat first appeared in the era of the silent movie. His popularity was immense and by 1923 he was starring in his own comic strip. Throughout the 1920s he grew in popularity and at the height of the Jazz Age he even had a hit song named after him, "Felix Kept on Walking". By the end of the decade however, there was a new character on the block; a mouse who could talk. Micky Mouse was an instant success making Felix look rather old hat. John Reynolds was the first artist to receive permission from the publishers to reproduce iconic images from the comics of D. C. Thomson. He has a passion for British comic art; a genre he claims has been long overlooked by the art market. Many of our much cherished characters deserve to receive the iconic status of their American or European counterparts such as Herge's Tintin or the Super Heroes of American culture. Celebrating characters such as Dennis the Menace, Desperate Dan and Alf Tupper, these prints have been carefully selected, enlarged and beautifully created in vivid colour. Anita O'Brien, curator of the Cartoon Trust in Bloomsbury says: "Each of the drawings in these strips has taken an enormous amount of work. I don't think the public have ever fully appreciated the illustrating talent that went into many of these early comics."